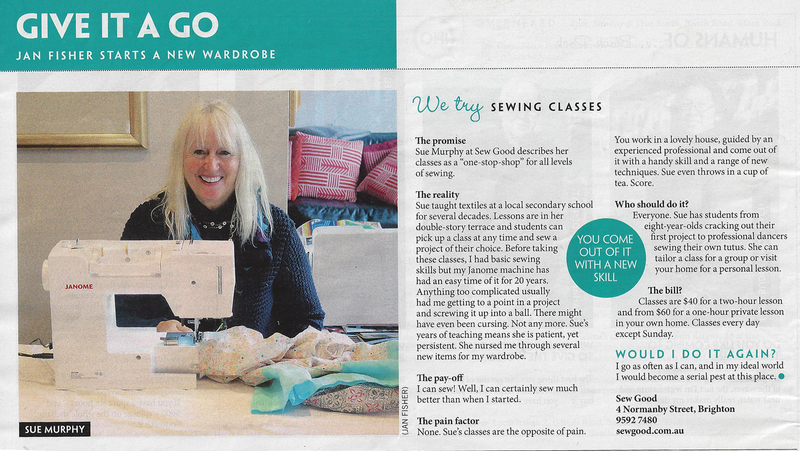 Melbourne sewing classes at Sew Good. Whether it is a basic beginner or more advanced sewing skills you are after. In Sue’s classes, you will be taught sewing methods based on industrial shortcuts adapted for the home machine – enabling you to have a full understanding of correct fit, construction methods, materials, and the sewing machine. Absolute beginners to advanced students are all welcome. You will learn techniques to make your project very creative, individual with a professional finish. Would you like to learn to make garments, evening wear, outfits, bags, toys or home-wares? Make garments to suit your shape and style and learn how to get the correct fit. Learn how to Alter garments to fit. Groups of no larger than six students tailored to each student. I am available to come to your house in Bayside if you are unable to travel or would prefer me to. If you live further away I add a travelling fee. Sew Good is your one-stop-shop for the very best Absolute beginners sewing ,Adult Sewing classes, Teenager Sewing classes or individual sewing or sewing machine Tuition. Lovely speaking with you today, really looking forward to our lesson in the new year. If you could send me the links for those machines that would be fab. I would happily recommend this Janome DC6030 machine. It is a very good quality sewing machine. Quite a few of my students have purchased it and they are all very happy with it.